This book arrived in the mail on a full moon. How cool is that!? Now . . . Oh. My. Gosh. Hoo Doggie, this man can spin a yarn! My pen weeps. This book was given to me as a gift by ER Bills, one of my editors from Road Kill. He met Jones at a signing and picked me up a copy knowing my love of all things werewolfy. 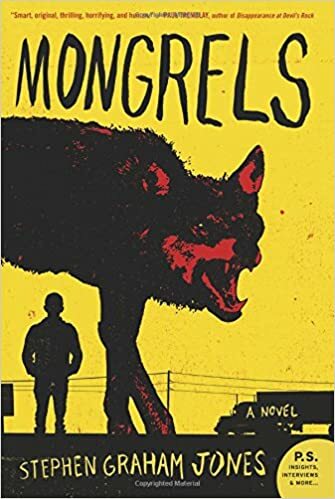 Mongrels tells the story of a young man as he grows up with his Aunt and Uncle, both werewolves, as they travel around the southeast United States. Told in first person and with grammar and outlook appropriate to the narrator’s age, this book is hard to put down. I loved the way Jones wrote each chapter as a separate short story. Almost . . . almost . . . they could have stood alone. But don’t fear, they are interconnected. The first chapter, if you are not familiar with the voice of the narrator, may be off-putting. Stick it out. If you aren’t hooked after two or three pages, you don’t like anything.